Here comes the GeekVape Aegis Legend Kit! It consists of an Aegis Legend MOD and an Alpha sub-ohm tank. 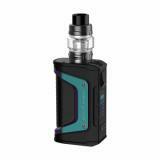 Powered by dual 18650 batteries, the Aegis Legend fires a maximum output of 200W. The Aegis Legend works with an upgraded AS Chipset, bringing stable performance and powerful output. Constructed with six high-quality materials, the Aegis Legend features extreme durability. The Geekvape Alpha comes with 4ml juice capacity and 25mm diameter. With the all-new MeshMellow coil system which can effectively enlarge the heating area and provide fast heating and huge vapor production, the Geekvape Alpha Subohm Tank will bring you an outstanding flavor with longer vaping. • It has no battery cell, you need order 18650 battery separately. • Quick Link: Aegis Legend MOD; Alpha Subohm Tank. Bought 2, 1 for me and 1 for my wife. She definitely needs a device known for its durability. We decided to go with Geek brand based on simple research which was provided by Element. For the most part I read the reviews on this site. The number of people that took time to right a review was impressive and now I also see why this Aegis Legend device had around 250 that were all ⭐️⭐️⭐️⭐️⭐️❗️ That’s what convinced me to go with Geek and not one of the 2 big brands I’d akways bought. Therefore when asked to give my review I thought its only fair that I show my appreciation by taking the time myself to say that the Geek Aegis Legend 200 with the Aero tank kit is very solid and a great buy. 200W GeekVape Aegis Legend TC Kit with Alpha Tank is a Limited Edition with Max output is 200W with dual 18650 batteries. It is constructed with New Magnesium Alloy material, which is currently the world's strongest and lightest metal.